Breaking Up With a Dream – Fix. Serve. As I have had the opportunity to get to know many of you through this blog, I’ve learned that this community is full of dreamers. We have big ideas to use our lives in big ways and we spend time inside our minds sorting through how we can propel ourselves to the next exciting endeavor. Those crazy dreams that I talked about in my very first post here are very real to us. At any given moment, you will find me holding two parallel lists reflecting variations of dreams. The first list includes dreams that I might trust one day – ones that could warrant some exploration and emotional energy at some point. The other list contains dreams that I know I am romanticizing ,but like to think about for fun. For instance, list number one includes things like getting my MBA, traveling out of the country, having a third child, writing a book, moving to Cleveland to embrace the rebirth of the city, etc. These may or may not be realistic, but I hold them close and remain in a constant state of learning about them. List number two is the safe place to file away all my crazy dreams that I am having an uninformed love affair with. These include things like having a third child, writing a book, owning a coffee farm, opening a bakery, living in another country, buying a fixer-upper in Cleveland, etc. Some dreams end up on both lists because they feel crazy and right all at the same time. Recently, I had the opportunity to try on a few dreams all at once when my husband and I went to Nicaragua. 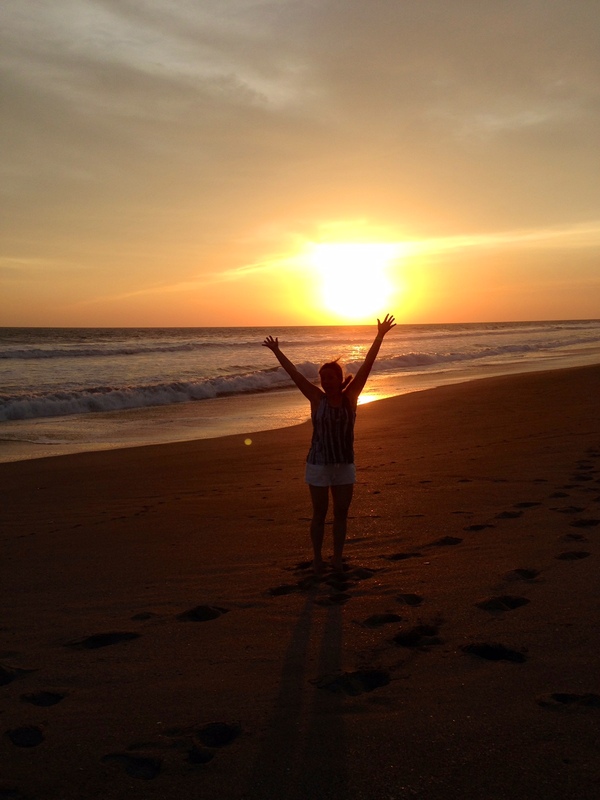 While the primary reason for choosing Nicaragua was for pleasure, I had personal motives because I knew that I would be able to dabble in a few dreams to see how they felt. First and foremost, I got a passport and left the country! Done and done. This was a HUGE dream of mine – I’ve wanted a passport since high school. On our trip, we stayed on a coffee farm during which I was able to take a tour and confirm that I am absolutely not qualified to ever own a coffee farm. I am very qualified to drink coffee, though. I will now bump that one off list number two and make room for something new. What I did not expect, was that this trip would resolve what has been my primary dream for the past four years – to have a third child. I’m not even sure if I should call this a dream. It’s more of a fact. I want a third child. I was pregnant with a third child. I did not have a third child. I refer to my situation fondly as my “kid cliffhanger” because I have not had any resolution… until now. Looking back on the months following that last miscarriage, I can say that asking my husband to get a vasectomy so soon after was a mistake. For me, though, it was a mistake that I don’t regret. At the time, the vasectomy closed the window of possibility for getting pregnant and allowed me to release all the energy I had been spending on that in order to open up new space in my mind to explore what I truly needed. I had the best years of my life following that miscarriage. I got a new job, I started running again and finally lost the lingering weight gifted to me by my youngest. I started becoming social again and spending time with friends since our boys were older and it was not punishment to come home after a night out only to wake up at 4am to feed someone. Life was good. What I found, though, was that closing the fertility window only erased the possibility of a third child; it did not erase my desire. It wasn’t long until I was convinced that adoption was the answer. I’ve always wanted to adopt. Way back when we were having our first string of miscarriages, we knew we would skip to adoption rather than fertility treatments if conceiving naturally proved to be a dead end. Years of sending away for packets, sitting in on webinars, researching the ethics of international adoption, watching “gotcha day” videos on YouTube, learning about the US foster care system and scouring blogs for real life examples left me very well informed. But there was nothing to do with all that information until my husband was comfortable with the idea. And he was not…until one night at dinner when we were in Nicaragua. On our first night, as we were dining in the middle of the vibrant street scape of Granada, he said the words I’ve wanted to hear for so long. “How about we start thinking about adoption.” But instead of leaping across the table in joy, I stayed glued to my chair in a stunned, nervous panic. What we didn’t know was that over the past few moths, in an attempt to move towards each other, we’d been moving to opposite ends again. But this time, I had decided to let go of my adoption dream and he had worked his way into it (I also had a brief moment where I was convinced a vasectomy reversal was the answer). My reaction to his offer was so surprising. The old me would have taken him up on it and had the process started by the time we returned from dinner. Instead, the offer fell flat. I spent the rest of the trip pondering this surprising reaction during our long bus rides across the country. Maybe I was just tired or overwhelmed with my fist time in a developing country. We had planned one last stop on our trip which I knew would be a pivotal experience for me – an orphanage and renutrition center that we support. That would surely reignite my passion for adoption. On the plane ride home, I felt it. The space in my mind that I travel to in the quiet moments was different. I go there to dream about this third child, and as I closed my eyes to do what I had been accustom to for years, I found that instead of visions and dreams of my third child, I had tears running down my face. I had to turn away so my husband would not see this strange break up going on in seat 27A. It was time. Time to let go of the notion that we will have a third child someday. It felt different now. There had been a shift inside of me, and I resolved that there will never be any resolution to this and that I needed to move on. Breaking up with a dream that I have held so close for so long has been quite an emotional experience. I sneak off to the bathroom sometimes to cry because in random moments, I find myself remembering that we’re done. This dream is a bit like losing a friend – we’ve been together for years and it’s held a starring role in my favorite pastime of letting my mind loose to script out a future of what will be. For those of us who are dreamers, breaking up is a big deal because our dreams are the fabric of who we are and who we will be. We hold on so tight to our treasured dreams, and often run the risk of not being able to sense when it’s time to let go. Life is funny like that. We want so badly to be in control and make every dream come true, but for some things, no amount of wishing and internet research will allow that dream to come into our lives as a reality. The process of discovering that is important, because despite the fact that merely writing about this is yet again making me cry, I know that I explored every aspect of this dream and that where I have landed is right, no matter how wrong it feels. Kind of like making a mistake that you don’t regret. Dreamers, let me remind you (and me) that letting go of a dream is not a failure. Rather, it is the outcome of successful self exploration, and the discovery that the right dream is still out there waiting for you to make it real. And so we replace the sadness with excitement knowing that the new space we have created in our hearts opens us to new possibilities that could very well become our next reality. Dream on, Dreamers. i always love reading your blog as your honest and vulnerable posts have so much to relate to and so much inspiring strength in them. i had NO IDEA how emotional family planning would end up being. our road to our baby was paved in several miscarriages and now that we have her i feel so grateful but also so conflicted if there could be or should be more babies in our future. at my age i don’t feel i have a lot of time to figure it out but it’s not something i want to force or rush either. not until we experienced our first loss did i start to realize just how many women (a shocking number, really!) and men (i can’t forget – loss and fertility challenges are tough on the husbands too) experience miscarriages and infertility and how much it impacts them personally and their relationships with each other. I feel extraordinarily grateful now, but the first two years of my marriage were riddled in loss and depression…and I realize our experience is a lot more common than i realized while going through it…going through it feeling terribly alone. anyhow, you’re as brave and amazing and inspiring as ever and i thank you for sharing these emotional (and literal) journey’s. Danielle – the empathy runs deep over here, and I can identify with how lonely it feels when you are in the middle of finding out that your fertility is not working in your favor. I’m so sorry you went through that. I think that’s why I ended up being so open about my experiences. Like you, I had no idea at the time how many people have been touched by this. I was so nervous to try again. In fact, we decided to start earlier than we would have because we assumed it would take a couple of years again. Elliot was only 14 months old when I found out I was pregnant with Alex – yikes! Which only reconfirmed that I have ZERO control over if my fertility comes through for me or not. Thank you so much for sharing your thoughts – I love being able to connect with some of my favorite people over these reflections. And let’s just end this by saying how incredibly beautiful Penny is…oh my goodness, please keep up the posts! You are such a terrific writer, Emily – don’t take that dream of writing a book off your list! Thanks, as always, for sharing your thoughts and your journeys. I was invited to be the last speaker in a local training series to empower women who were under/unemployed last week and one topic I was asked to discuss was decision making. They each gave examples of important decisions they had made in the last couple of years. These decisions ranged from getting out of abusive relationships to overcoming addictions and alcoholism. They were all ready to continue to move forward in their lives, and many were in angst about making decisions about a job or starting school now. It made me think that at pivotal times when you can turn dreams into reality, there probably is no wrong decision…it is that recognition to be open to options and opportunities, and opening up space in your life to room for something new and next…at the right time and place, and if you are in angst or questioning, or even feeling a certain way physically, it may not be time now to do it. Things happen to give us clarity and content, and often it is taking us out of our normal routine or physical space to allow that to happen or to recognize it. Good for you. Your words speak of something that needs to be said and acknowledged. Thanks!